Participants in this video game simulation must decide whether to shoot a man carrying an object that resembles a gun. Would an unarmed black man be spared a barrage of 41 bullets fired by police officers if he were white? It is a question that’s been consuming Joshua Correll ever since Amadou Diallo, a 22-year-old Guinean immigrant, was killed by New York police officers in 1999 as he reached into his pocket for an object the officers believed to be a gun. An assistant professor of psychology at the University of Chicago, Correll has been trying to find the answer through a series of studies he has published since 2002. Through a video simulation Correll and his colleagues created, the studies tested 270 police officers from 15 different states and 187 civilians in an attempt to gauge how racial bias plays into a police officer’s decision to shoot a suspect. The studies came up with two main findings. The first one, Correll says, was “reassuring.” It showed that police officers were less likely to shoot an unarmed man, regardless of race, than the majority white and Latino civilians who were tested. But the second finding was less sanguine. It showed that the officers, just like untrained civilians, seem to exhibit racial bias in their reaction time: They were quicker to decide not to shoot an unarmed white suspect than an unarmed black suspect and slower to decide to shoot an armed white suspect than an armed black suspect. The results, Correll believes, suggest that participants associate African Americans with more violence. And the implication could be ominous, he said. “Even if the don’t-shoot mechanism translates, there can be bias in who people choose to stop, so police may wind up in more confrontations with black suspects,” he said. Correll’s study is part of a growing body of nationwide research called “implicit association,”which seeks to predict behavior based on an individual’s level of bias. By testing human responses under time pressure, researchers have found that people are not immune from developing their own unconscious biases. A white man appears on a background of a park bench. He holds an object in his hand. It’s black and has a sharp edge. You have a few milliseconds to decide if the man is holding a gun. Pulling the trigger before he does is your only line of defense. You can press either “shoot” or “don’t shoot” button. 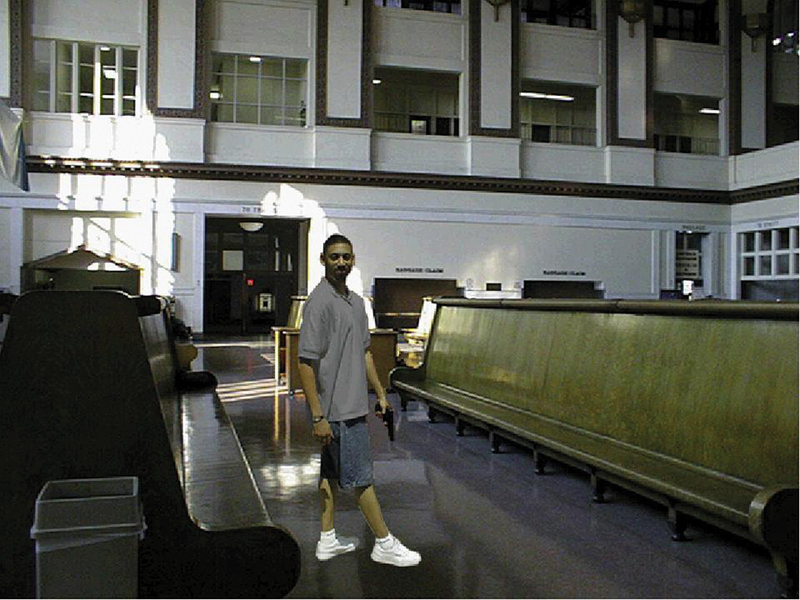 Next, a black man appears at a train station. He’s holding an object that blends in with the color of the background. He’s standing at a 45-degree angle from your line of sight, making it hard to judge if he has a gun—or a cell phone. The simulation goes on like this for about 12 minutes, with upwards of 100 targets appearing. Matthew Tobias, assistant deputy superintendent in the Chicago Police Department, said factors are more complex when making the decision to shoot in the real world. “Factors such as the level of crime in an area, recent crime events in the neighborhood, the time of day and lighting factors all affect an officer’s ability to make a good decision,” he said. Ashunda Harris, a 36-year-old African American, disagrees. Harris looks at the issue through the painstaking reality of what happened to Aaron Harrison, her 18-year-old nephew. In August, Harrison was shot and killed by a police officer in North Lawndale, a predominantly black neighborhood on Chicago’s West Side. In recent years, Harris said, police have become increasingly aggressive in the neighborhood, humiliating young black men in particular. “They are demeaned and humiliated on a daily basis,” she said, her voice still trembling with anger at a community protest in the wake of her nephew’s death. For his part, Correll believes that implicit association studies like his can be used as a step in finding the weak links in a system. “If you understand why a system works, you can understand when it is going to break down,” he said. In her newest book, historian and political activist Barbara Ransby examines the emergent Black Lives Matter Movement, discussing its roots and motivations, its politics and its future.